If applicable, remove giblets from chicken, and reserve for another use. Rinse chicken. Place chicken, celery, carrots, and salt in a large Dutch oven with water to cover. Bring to a boil over medium-high heat; reduce heat to low. Cover and simmer 50 minutes to 1 hour or until chicken is done. Remove from heat. Remove chicken from broth; cool 30 minutes. Remove and reserve 3/4 cup cooking liquid. Strain any remaining cooking liquid, and reserve for another use. Preheat oven to 350°. Melt butter in a large skillet over medium-high heat. Add onion, and sauté 6 to 7 minutes or until tender. Add bell pepper and garlic, and sauté 3 to 4 minutes. Stir in reserved 3/4 cup cooking liquid, cream of mushroom soup, and next 5 ingredients. Cook, stirring occasionally, 8 minutes. Skin and bone chicken; shred meat into bite-size pieces. Layer half of chicken in a lightly greased 13- x 9-inch baking dish. Top with half of soup mixture and 1 cup Cheddar cheese. Cover with half of corn tortilla strips. Repeat layers once. Top with remaining 1 cup cheese. Bake at 350° for 55 minutes to 1 hour or until bubbly. Let stand 10 minutes before serving. *1 tsp. chili powder and 1/8 tsp. ground red pepper may be substituted for Mexican-style chili powder. Lightened King Ranch Chicken Casserole: Reduce butter to 1 Tbsp. Substitute reduced-fat cream of mushroom and cream of chicken soup for regular and 2% reduced-fat cheese for regular. Prepare recipe as directed through Step 4. Bake, covered, at 350° for 50 minutes; uncover and bake for 10 to 15 minutes or until bubbly. Let stand 10 minutes before serving. Note: For testing purposes only, we used Cracker Barrel 2% Milk Natural Sharp Cheddar Cheese. 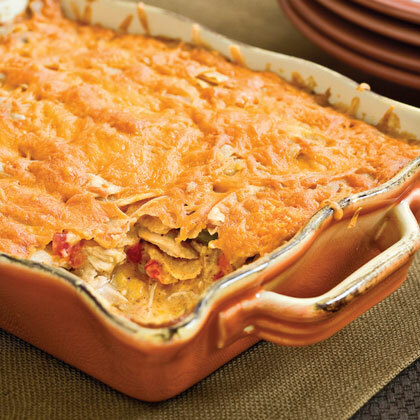 Quick-and-Easy King Ranch Chicken Casserole: Substitute 1 (2-lb.) skinned, boned, and shredded deli-roasted chicken for whole chicken, 3 cups coarsely crumbled lime-flavored white corn tortilla chips for corn tortillas, and 3/4 cup chicken broth for cooking liquid. Omit celery, carrots, and salt. Prepare recipe as directed, beginning with Step 3.